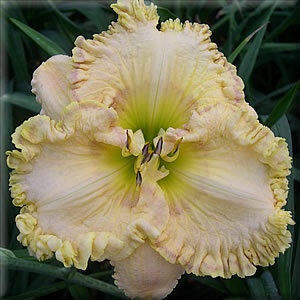 RAINBOW FROST (Dan Trimmer) Tetraploid (Dancing With Julie x Darla Anita) 28” EM Re. Ev. 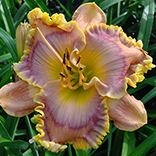 5 ½” RAINBOW FROST is a delicate, subtle, intensely ruffled bloom coming from crossing DARLA ANITA onto my rounder eyed lavender DANCING WITH JULIE. The result is a flower with the look of a frosted rainbow on a winter’s day. It has the palest of eyes and a double edge under a frosting of snow. I have crossed RAINBOW FROST into some blue-eyed seedlings and eagerly await the results! RAINBOW FROST is such a great grower I have lined out mostly double fans.